On a trip to Paris, I decided that if I were ever to be given the choice of anything I wanted for my last meal on earth - I would want my very last bite to be of a macaron from Laduree. If that choice had to be specific to cupcakes - I might have to require that it come from Big Sugar Bakeshop. Tucked away in a tiny store on Ventura Blvd. in Studio City, one of the rare areas of the San Fernando Valley that is not just suburban sprawl, but truly full of personality (yes, in the Valley!) - Big Sugar Bakeshop serves up extraordinary sweets from the best staple cupcakes in LA, to cookies, lemon bars and custom baked tarts. to light the flavor shine through - there is just enough of it to be a 'topping' for the cake, which is then embraced by a sheer layer of fine grained sugar. All these skillfully crafted elements come together to make for an incredible experience starting with a delicate crunch, to divinely smooth creaminess, and finishing off with a light fluffy cake. The portion size is equally perfect - it takes between 4-6 bites to finish a Big Sugar cupcake - just enough to feel satisfied. 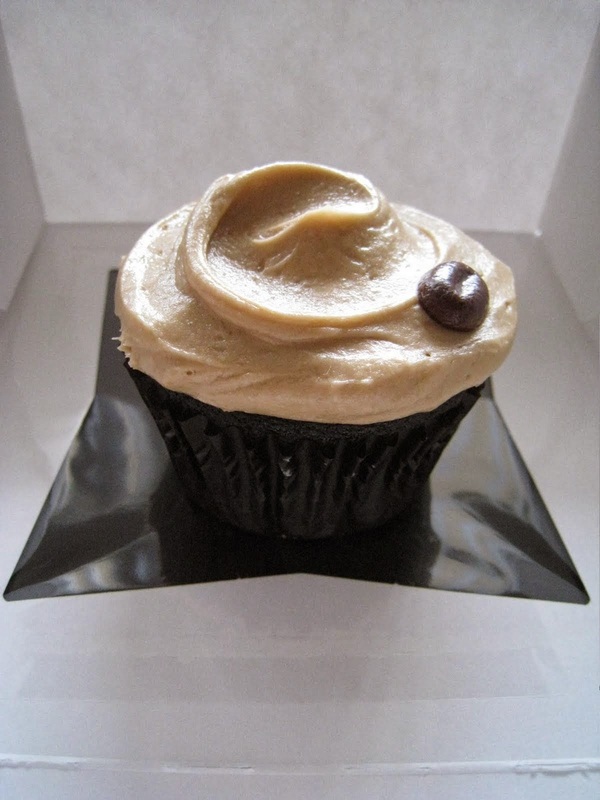 By comparisan, Crumbs cupcakes are so dense that eating one feels a bit like sinking a mattress into the sea - you can almost feel it every step of the way as it plunks its way down. I would say it takes between 8-12 bites to finish a Crumbs 'signature' sized cupcake - which some might see as getting more for your money, but which I see as too much - you feel tired and sick from sugar overdose by the time you get about halfway through. They do offer two smaller sizes - 'Classic' and 'Taste' - but the same problem with density (with the cake and amount of sugar in the frosting) still apply. Sprinkles cupcakes ($3.25) are in my opinion better than Crumbs - they are lighter and you can actually taste the cake and frosting beyond the sugar. They do have interesting flavors like Chai Latte and Ginger Lemon. I also applaud them for offering Gluten Free and Vegan options. However, what I respect from a marketing/ branding perspective (their branding is genius and thoroughly infused throughout every element from their stores, to packaging and product) - I truly despise in terms of taste experience. Their signature sugar candy 'sprinkle' / double dot that sits atop every cupcake, while a great branding element, shoulders a lot of responsibility for ruining the experience - the sugar candy piece is tasteless and rock hard - after trying several times to bite into it without success, I ended up spitting it out - it's just not worth the cost of potential dental repairs. Where Big Sugar does not measure up to the others, is in variety. The staple flavors - while reliably amazing - are part of a very short menu of flavors on offer (there are five that are available every day: 'Just Vanilla', 'Belgian Chocolate', 'Red Velvet' and 'Chococcino' and 'Double Coconut'). There are some rotating Daily and Seasonal Specials - which are all very good (chocolate with vanilla bean frosting and chocolate sprinkles are a favorite) - but not incredibly innovative. 'Icebox' and 'Boston Cream Pie' are a few standouts – the first consisting of chocolate cake with fresh whipped cream filling and chocolate ganache, and the second a vanilla cupcake with vanilla bean pastry cream filling and chocolate ganache. Vanilla Bakeshop in Santa Monica beats Big Sugar in the area of creativity, with flavors original to cupcakes, like 'Meyer Lemon Raspberry' (my favorite), Mint Chocolate, Key Lime and the recent addition, Blackberry with Passionfruit ($3.25). They also offer 'baby' cupcakes for the more sugar-conscious, or those who just want to be able to sample more flavors without committing room, and money, to a full-sized cupcake - in a package deal of 3 for $5. Overall, Big Sugar Bakeshop is in my view the best staple cupcake place in LA for consistently great taste (and great price). Their little shop is also adorable, with two tables for those who want to stay and enjoy their treats on a sunny afternoon, and lots of quaint trinkets for those who may want to pick up something on-theme to go with the edible gifts for friends or family (highlights include dessert plates, adorable hand-made cards, cute/edgy 'kitchen fashions' (aprons etc.) and baking books). Most people who come through Big Sugar's doors are regulars, and with good reason! Who couldn't use an extra $4000 these days? But an extra $4000 from one of my favorite mid-priced steakhouses in the country? I'm tempted not to share the info to improve my own odds for my entry. But, this sweepstakes is too good not to share - BLT Restaurant Group needs your help in naming three new burger restaurants in New York, DC and Los Angeles! Read the description of the restaurant concept on the sweepstakes site, to get a feel for what these new restaurants will be like. Once you have your brilliant idea ready, fill out the form to submit your entry for your chance to win. Three entries will be selected for the final cut on May 5, 2010, then the winner will be chosen via public vote on. Winner will be announced on May 10, 2010. You only get one entry per person, so think hard and do it before April 30! Grand Prize (1): a check for $4,000. Runners up (2): $250 gift certificate to any BLT Restaurant Group restaurant. The historic L.A. Farmer's Market has always been one of my favorite places to go on a Sunday morning / afternoon. It reminds me of an open air market in Hawaii, with its laid back atmosphere and plethora of stalls serving tasty food of all cuisine types at very reasonable prices. 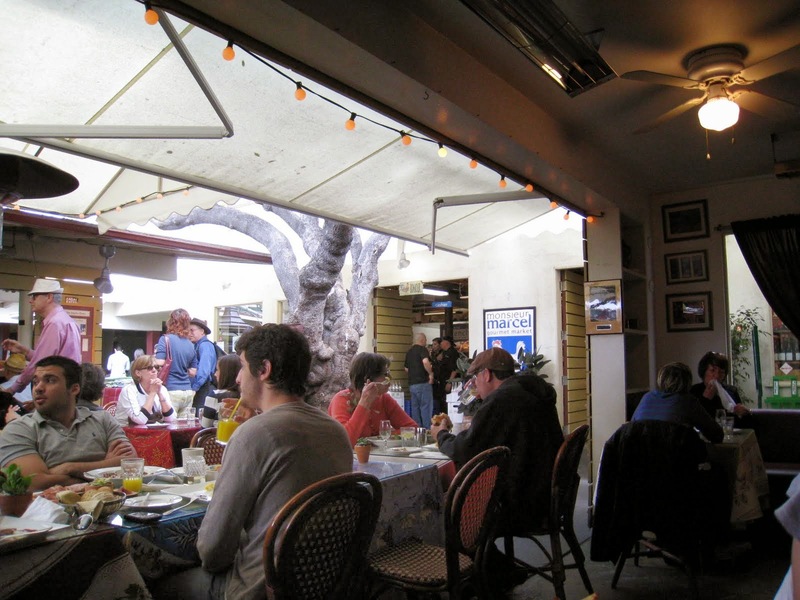 Among the abundant selections, my favorite spot is Monsieur Marcel - which offers culinary experiences in two parts - an al fresco bistro and an attached gourmet market. The bistro part of Monsieur Marcel feels very relaxed and European - in fact, every time I've gone, I've seen French natives take leisurely (i.e. three hour) brunch / coffee breaks there. It's one of the few places in the Farmer's Market that has it's own sit-down service - other stalls are set up food court style - you order and pick up your own food at the counter, then find your own seat in the open space. 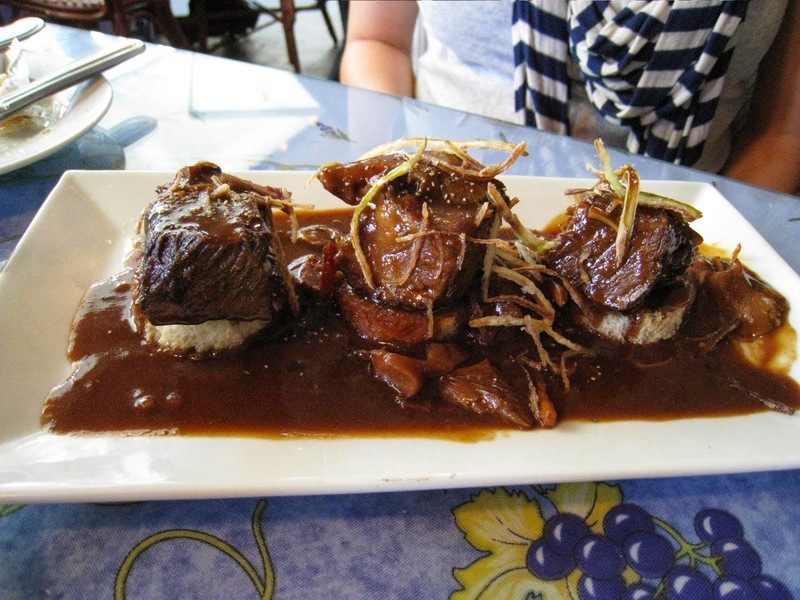 The menu has a large number of offerings which all had us salivating on sight, including escargot, salade nicoise, foie gras, steak tartare, moules marinieres, quiche lorraine, bouillabaisse, coq au vin and many, many other French staples. 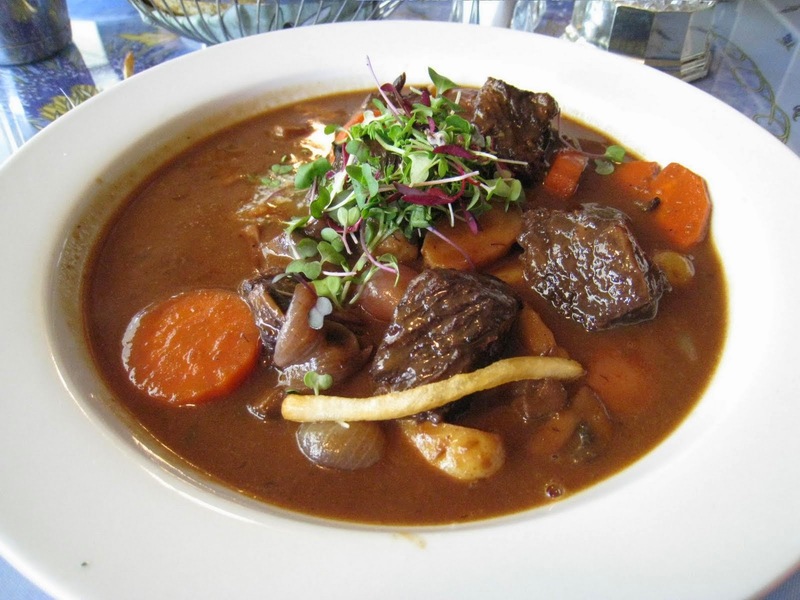 I decided to go with Boeuf Bourguignon ($15.49), as I know from past attempts to make this at home - that it takes almost an entire day of prep and cooking time to infuse all the rich flavors in the dish, plus it takes two bottles of burgundy wine which in itself would cost $20 minimum - so this dish is one that I have decided to only order at restaurants unless a special occasion calls for a home-made rendition. Monsieur Marcel doesn't disappoint - the stew was rich with flavor and the wine in the sauce made me want to lap up every last drop, with the help of the basket of fresh baguette bread. To accompany the stew, we ordered some Truffle Frites ($7.00) - though they were not as good as the ones at Petrossian (which were fresh fried, and thicker cut - allowing more real estate to infuse with truffle flavor), as you can see I was stuffing my face so fast with these that I didn't even notice one had fallen into my stew! My friend ordered a dish off the Chef's Selections menu - braised short rib with a bunch of ingredients that I now can't remember ($14.95), which she also thought was delicious! Another benefit of dining at Monsieur Marcel is that you can walk off the meal afterwards either within the Farmer's Market (and stop at the various stalls for samples or dessert - there's a great crepe stall in about the center of the market), or hit the shops at The Grove next door. For us, after the meal, we headed straight for the Monsieur Marcel Gourmet Market, just next to the dining area. They have the most amazing imported cheeses (including Brillat Savarin - with papaya! ), chocolates (anything from mass selections like Cadbury's Crunchie bar, to the more refined Vosges bacon chocolate bar), olive oils, vinegars, spices and of course wines. They are also the only place I've seen offer a baby baguette ($1.15) - my favorite as I can NEVER finish the full-sized ones and hate wasting half a stick of bread every time. All in all, a great place for a leisurely Sunday brunch / stroll! My first exposure to the Katsuya experience was at the Katsuya by Starck Glendale location, at the Americana. I had heard rave reviews about the Katsuya chain, and as I happened to have visitors who wanted to go to dinner on a weeknight (so I needed to stay close to work in the Valley) - we decided to check out the Katsuya at The Americana at Brand in Glendale. The restaurant stood out in the Valley like a beacon - with that combination that's so hard to find, in the 'burbs, of incredible interior design and great ambience, with amazing food. Though it is a technically a chain, it definitely didn't feel like one. Centrally located just off the featured water fountain at the outdoor shopping/dining/housing complex known as The Americana at Brand (The Grove of the Valley, but with condos directly attached to the complex) - Katsuya Glendale has two floors of sleek interiors that seemed to be a highly modernized take on Japanese pagodas, and an outdoor terrace that overlooks the promenade (great for people watching). We were seated at a booth with floor to ceiling panels, appropriately private and great for a small group to hold conversation - but yet allowing enjoyment of the chic ambience of the restaurant. The food was equally impressive - creative dishes are served alongside more traditional rolls, with the creative ones exercising enough restraint to remain refined and not 'gimmicky' (there aren't any showy pieces that indicated a chef throwing things together purely to display creativity - the ingredients were truly thoughtfully matched, and everything tasted amazing). My favorites were: Crispy Rice with Spicy Tuna, Kobe Filet with Foie Gras, and Almond Crusted Scallops. On the next chance I got, we ventured down to the Hollywood location. This location is supposed to be more of a hotspot at night, but not being much into the Hollywood scene, we decided to go on a Saturday afternoon for lunch. I arrived a bit earlier than my party and decided to wait at the bar - turns out this was a fortuitous choice, as the bartender proceeded to convince me to try a drink (despite it being just past noon!) called the 'Burning Mandarin' - glancing at the menu, this drink did not sound like something anyone would like at all - Mandarin vodka with lemon, orange and cranberry juice and crushed chili. It was too early in the day to drink as it is, much less to try a drink with chili in it! But, the bartender (from Minnesota!?) had an irresistible charm and promised that I would like it - he promised not to charge me for the drink if I didn't. If you've read my previous posts, you know that I'm pretty adventurous with food - so I decided to apply this philosophy to drinks as well, on this day. The Burning Mandarin turned out to be my favorite drink of all time - it's very sophisticated with layers of flavor that are slowly revealed - the chili perfectly offsets the sweet/tartness of the citrus juices and everything is held together by the vodka - which is also in perfect proportion to everything else in the drink. I would drive any distance to get to Katsuya, just for this drink. When my party and the food arrived, everyone was also very impressed with the quality and presentation of the dishes - as the menu is pretty much the same as that in Glendale, I won't go into detail here. The third location I've visited is at L.A. Live - also with interior design by Starck. This one is part of a primarily dining complex attached to the Nokia Theater in downtown LA. The name of the complex is very appropriate - as it's really breathed new life into a previously rundown area that locals really have no interest in visiting, except to go straight to Staples Center across the street for sports games (but usually hopping straight into your car to go home, after locking the doors of course, in case any of the more aggressive transients in the area decide to approach your car at a stoplight). This glitzy new complex houses multiple fun and moderately priced restaurant / bar chains including Yard House, Trader Vic's, The Farm of Beverly Hills, and Wolfgang Puck Bar & Grill, and provides perfect places to hang out before or after a concert / sporting event at either the Nokia Theater or Staples Center. We actually went just before a concert, and had of course a few of my favorite Burning Mandarins and Watermelon Mojitos. This location has just one floor, but has the signature streamlined, modern, chic interior design, and patio seating - great again for people watching, especially since you will see some interesting characters depending on the concert you're going to! So, I have a pretty unusual philosophy about my restaurant choices - once I've determined that I really like a place, I won't usually go back very often, as in my mind, I've already discovered that I like it - so I know that I can always go back to it for special occasions, or if I have visitors etc. There are so many other restaurants that I haven't experienced yet, and my true love is to experience things for the first time - so I keep places that are know are good on my 'favorites' list, that I can always count on, and then go out to try new places until I find one that unseats a previous favorite from its throne and moves it down the list. That is how I like build my 'collection' or personal database. BUT with Katsuya, I've repeated visits an inordinate amount of times, just because I really like it that much. I've varied the locations so that I can have my new experiences that way. Until recently I had collected just the three SBE-owned and operated / Starck designed locations above - but had heard that actually the location closest to my work, and the first Katsuya to open for business, 'Sushi Katsu-ya' in Studio City, is actually the best of the chain and usually impossible to get a table at. I was a little skeptical of that, knowing that the restaurant is located in a strip mall off of Ventura - how sophisticated / epic can it be? I was too busy noting all the things that supported my theory that this is actually an inferior location - the decor is typical and uninspired - lots of light-colored wood counters, tables and chairs, and the place was small (there were maybe 12 spots in the parking lot, and you can see straight across the restaurant from end to end, from the tiny 'lobby') - that I was a little blown away when the food arrived and it was good. At my co-worker's behest, I tried the Sauteed Shishito Peppers for the first time...and it was amazing, perfect amount of crunch and salty flavor, served at the perfect temperature (piping hot, but not enough to burn your mouth!). I pushed the edamame aside so I could have room to finish the pepper dish. What I found I also liked about this place is that they had a boatload of specials. We had the Crispy Soft Shell Crab, which was perfectly fried and seasoned, Scallop Sashimi with Foie Gras (the creamy, yet firm texture of the foie was to die for). It goes without saying that I had to have the signature Crispy Rice w/ Spicy Tuna (which did not have the nice clean 'lines' of the SBE locations in terms of presentation, but actually might have tasted a little better as the rice was still warm). My only complaints were that the quality of food was not consistent - we had another salmon dish which didn't taste fresh and was somewhat bland - and that they didn't serve cocktails at this location - the drinks menu was lackluster with just a few selections of house wines, beer, sake, ume wine and soda, iced tea and water. However, I was happy with the bill, which came out to only $45 per person (for two) including tip, and I left stuffed. So how does the original measure up to its SBE counterparts? Perhaps I'm a food snob, but to me a great dining experience has to be impressive in all elements - not only does the food have to be amazing, but the ambience of the venue is a big factor in the overall experience as well. So while Sushi Katsu-ya Studio City is a great place for happy hour dining (note dining only, the selection of alcohol is disappointing!) for those already in the Valley - I would not make an extra effort / trip to visit this location. To me, the SBE locations win hands-down. And out of the three that I've visited, I would say actually that the Glendale location is my personal favorite - perhaps because it does not have any competition of equal caliber in the Valley, but mainly because it has all the elements that make Katsuya great AND it's easy to find parking (large structure in Americana complex) AND there's lots to keep you entertained before/after your meal, with a large promenade full of shops like Anthropologie and BCBG, a huge multi-story Barnes and Noble, and a movie theater just steps away - you can even snack on a Papa Beard cream puff before/after the movie - all in all, a nice day/night out. Went back to Sushi Katsu-ya for a weekday lunch (mini escapade from work) and had a really tasty plate of "Mixed Sashimi" lunch ($14) with chef's selection of assorted fresh fish with rice and a side salad. I like to call it 'omakase light' - a steal at only $14!!!!! [Deal alert Nov 2011: Katsuya offers happy hour Mon-Fri 5-7pm with selected nigiri sushi, tuna on crispy rice roll, and hand rolls (my fav is the baked crab hand roll) at $5 each, and selected drinks for $7 each. Check with each location for details. The Glendale location even validates valet parking for 3 hours! In recent weeks, Groupon has become my new BFF. If you haven't signed up yet - do it now. You get daily emails with 50% deals at hotspots around your city, for "the best things to eat, see, do and buy"! How does this relate to the latest 1MB post, you ask? Well on a beautiful Sunday morning in LA, I decided to use my $50 Groupon on brunch for two, at a place I've only ever visited (and loved) for dinner - Taste on Melrose. The menu is quite a bit different than the one for dinner - my favorite truffle risotto (so fragrant and intoxicating that I practically inhaled the dish, plate inclusive, every time I had it) was noticeably missing. Luckily though, both brunch and lunch menus are offered around the time we arrived - 1pm. The truffle hog in me quickly spotted an apt-looking replacement - a White Truffle Oil and Mushroom Mac and Cheese ($8.50). 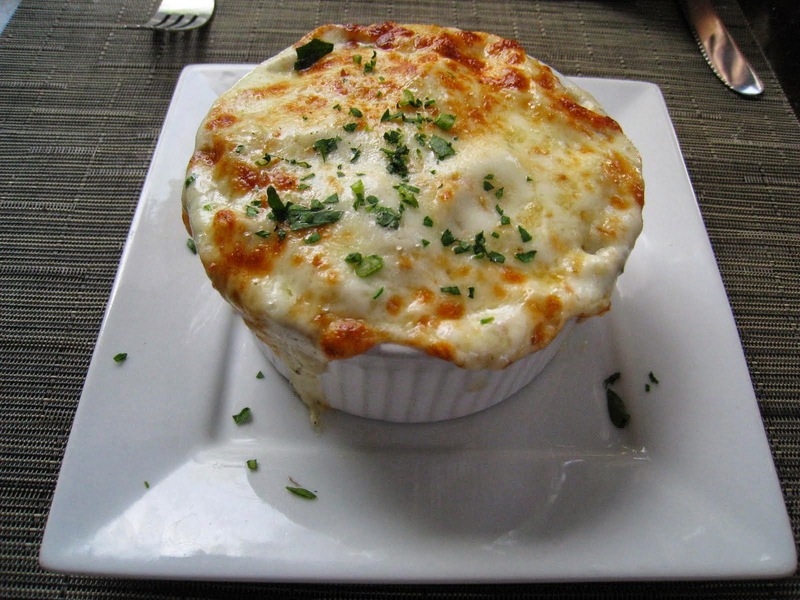 Though from the appetizer section of the lunch menu, this dish arrived in a giant ramekin which looked big enough to be a meal for a smallish person! We ended up splitting this appetizer - the truffle fragrance was just as evenly infused throughout the pasta shells as it is in my beloved risotto, but the mac and cheese fell short of expectations for several reasons: the conchiglie shells were not the right shape for this dish - they slid around uncomfortably in your mouth and did not provide a smooth surface for the cheese and indulgent truffle flavors to deposit themselves for maximum enjoyment - and to make matters worse, the shells were overcooked. The layer of cheese that blanketed the top of the pasta was way too thick and greasy, while the cheese that held the pasta shells together had a consistency that was a bit too 'thin' and again, too greasy. The whole thing ended up being overly rich and unsatisfying at the same time. 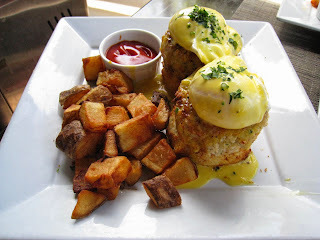 Not sure how many people order an appetizer and an 'entree' for brunch - but I couldn't pass up the Crab Cake Benedict - at least, in concept: the dish was to offer up poached eggs on a toasted brioche and crab cake, with hollandaise sauce and a side of rosemary garlic potatoes ($15.25). Perhaps I set my expectations too high, based on my experiences at Taste for dinner meals - but the Crab Cake Benedict definitely disappointed on several levels: in my view, as a rule, the central focus of any benedict dish should be the combination of a smooth, creamy poached egg, with a warm, crispy toast underneath - embraced in a rich hollandaise sauce that pulls all the elements together. Any additional ingredients should be used to enhance the experience of the mix, and should not overwhelm it. Taste breaks this rule, and not to great effect. From the start, all the proportions were off - the crab cake and brioche were the same size - two towers each with one thick crab patty on top of a thick round of bread. Sitting atop each tower was an egg that looked sadly dwarfed by comparisan - you normally only see 'Large' or 'Extra Large' eggs at the grocery store, and to me these eggs looked like they would be size 'Small' - they could almost pass for garnishes rather than the central show piece. The crab cakes were pretty dry and bland, while the brioche fared no better in those areas. They could have really used the help of the creaminess of the egg and hollandaise sauce, but unfortunately there wasn't enough of either to go around. I get that in general people don't want strong, pungent tastes in the morning / for brunch - but that doesn't mean dishes served during this time should be absent of flavors! Even the rosemary garlic potatoes were bland. My friend ordered the Taste Cobb Frittata with shredded chicken breast, applewood smoked bacon, avocado, tomatoes, gorgonzola cheese, green onion, gorgonzola dressing and rosemary garlic potatoes ($11.25). She thought it was good enough, but unimpressive. The real saving grace of the meal was that our total came to $48.21 - the waiter actually noted that we had just over a dollar something left in the Groupon that we could have used - considering that we only paid $25 for the $50 meal, it was a great time!